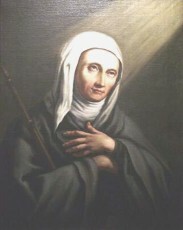 St. Angela Merici was born in Lombardy, Italy. She and her older sister Giana Maria were left orphans when she was about ten years old. They went to live with their uncle in a small town called Salo. Giana Maria, her older sister got really sick, and died without receiving the Last Sacraments. This really upset Angela, and she joined the Third Order of St. Francis, and increased her prayers to God so her sister’s soul would be at peace. She had a vision of her sister, as she stood in the company of saints in heaven, and this satisfied Angela that Giana was in heaven. Angela had beautiful hair that most people admired, and she promised herself to God and did not want to be admired, so she dyed her hair in soot and water so it would not look so beautiful. Angela’s uncle died when she was twenty years old and she returned to her previous home in Desenzano. She believed that Christian education was needed for young girls. She converted her home into a school and started to teach young girls. She had another vision that revealed to her that she was to found an association of virgins, who were to devote their lives to the religious training of young girls. She was so successful that she was invited to start another school in the neighboring city, Brescia. She was thrilled and accepted the offer. In 1524, while traveling to the Holy Land, St. Angela became suddenly blind when she was on the Island of Crete. Despite this handicap, she continued on her journey to the Holy Places and was ostensibly cured of her blindness, while praying before a crucifix, at the same place where she was struck with blindness a few weeks before. In 1525, she came to Rome to gain the Indulgences of the Jubilee year. While making her pilgrimage, Pope Clement VII invited her to stay in Rome. He had heard of her virtue and success with her school. She was uncomfortable with notoriety, and soon returned to Brescia. On November 25, 1535, St. Angela Merici chose twelve virgins and started the foundation of the “Company of St. Ursula” near the Church of St. Afra. She used a small house in Brescia to start this foundation. On March 18, 1537, she was elected Superior of the Order. She died on January 27, 1540, and her body was clothed in the habit of a Franciscan. She was buried in the Church of St. Afra, in Brescia. She was beatified in 1768 by Pope Clement XIII, and canonized in 1807 by Pope Pius VII. During the Second World War, on March 2, 1945, St. Afra was completed ruined with allied bombing. This structure was rebuilt after the war and became known as the “Merician Center”. St. Angela Merici was born in Italy, and she and her sister were orphaned when she was ten years old. They went to live with her uncle, and her sister became ill and died. She worried about her sister’s soul, since she died suddenly without the Last Sacraments. She prayed hard and finally had a vision of her sister with the saints in heaven. She later had another vision asking her to start a foundation. She started a school for young girls and went on to found the religious order, “Company of St. Ursula”. She spent her life serving the Church and others, bringing Christ to all.